Ah January — a time for setting goals and making resolutions to change. So many of us do it, yet by the end of the month so many of us have gone astray, reverting to our old ways. This month’s book is one to help us define and stick to our resolutions by forming new goals habits. Yes, focusing on habits is much more likely to end in success than trying to focus on goals. As James Clear puts it, Goals are good for setting a direction, but systems are best for making progress. Every team intends to win the championship, but it’s the ones who put systems (habits) in place to make sure the work’s done right every day who are more likely to succeed. 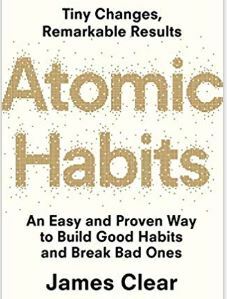 Atomic Habits will change your understanding and approach to habits. It’s not only a good, solid description of how to to get those habits built (or torn down, in the case of exiting bad habits), but also the reasons why habits work or don’t, stick or don’t. It’s all about making small, sustainable changes in your daily life, intentionally creating an environment to encourage those changes, and making yourself accountable. While those may sound like easy things to do, actual change takes planning, and persistence — building the daily system, the end result of which is the change you desire. Besides, February 1st — or whenever you read this — is just as good a day to start your journey to a new you as January 1st was. Get yourself going today; watch yourself turn tiny changes into remarkable results, with Atomic Habits.